, an eminent nonconformist divine, was born Nov. 12, 1615, at Rowton, near High Ercal, in Shropshire. 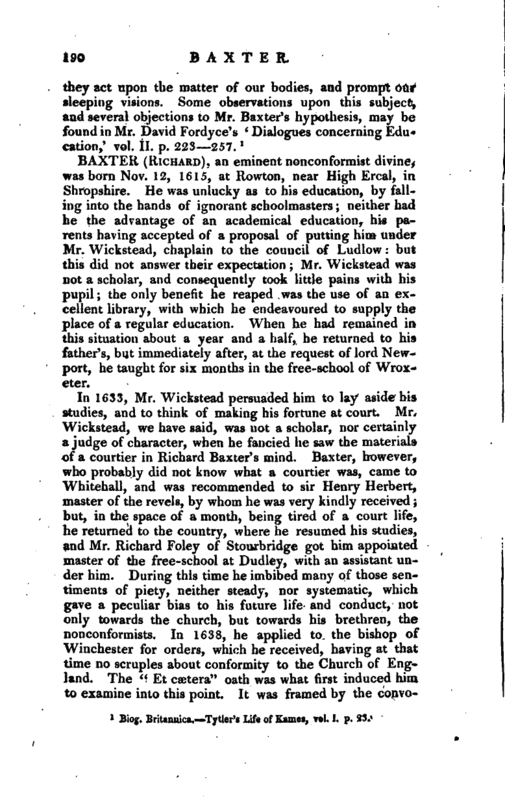 He was unlucky as to his education, by falling into the hands of ignorant schoolmasters; neither had he the advantage of an academical education, his parents having accepted of a proposal of putting him under Mr. Wickstead, chaplain to the council of Ludlow: but this did not answer their expectation; Mr. Wickstead was not a scholar, and consequently took little pains with his pupil; the only benefit he reaped was the use of an excellent library, with which he endeavoured to supply the place of a regular education. When he had remained in this situation about a year and a half, he returned to his father’s, but immediately after, at the request of lord Newport, he taught for six months in the free-school of Wroxeter. In 1633, Mr. Wickstead persuaded him to lay aside his studies, and to think of making his fortune at court. 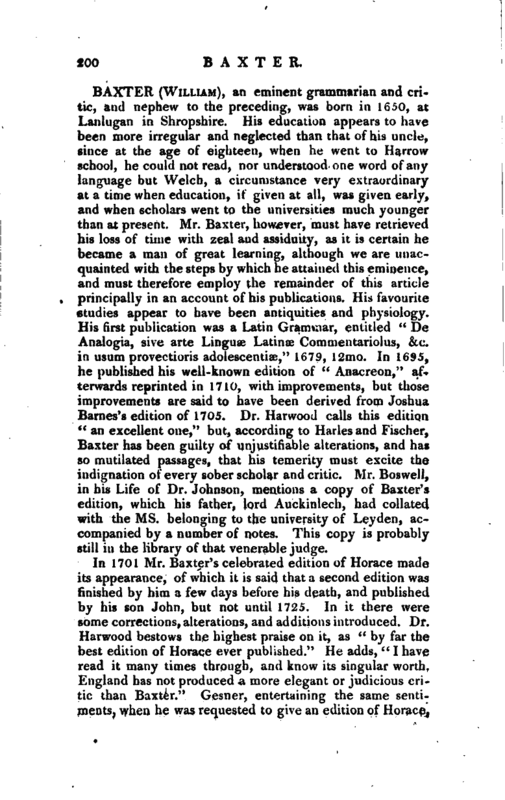 Mr. Wickstead, we have said, was not a scholar, nor certainly a judge of character, when he fancied he saw the materials of a courtier in Richard Baxter’s mind. Baxter, however, who probably did not know what a courtier was, came to Whitehall, and was recommended to sir Henry Herbert, master of the revels, by whom he was very kindly received; but, in the space of a month, being tired of a court life, he returned to the country, where he resumed his studies, and Mr. Richard Foley of Stourbridge got him appointed master of the free-school at Dudley, with an assistant under him. During this time he imbibed many of those sentiments of piety, neither steady, nor systematic, which gave a peculiar bias to his future life and conduct, not only towards the church, but towards his brethren, the nonconformists. In 1638, he applied to the bishop of Winchester for orders, which he received, having at that time no scruples about conformity to the Church of England. The “Et caetera” oath was what first induced him to examine into this point. 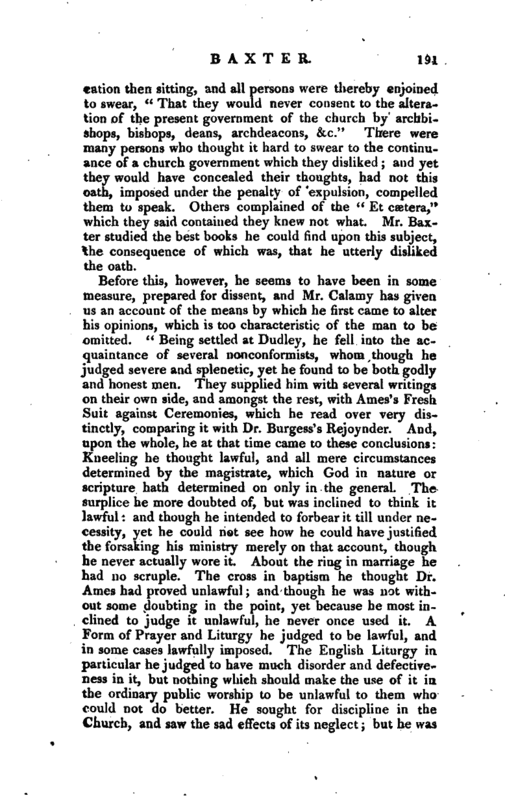 It was framed by the | convocation then sitting, and all persons were thereby enjoined to swear, “That they would never consent to the alteration of the present government of the church by archbishops, bishops, deans, archdeacons, &c.” There were many persons who thought it hard to swear to the continuance of a church government which they disliked; and yet they would have concealed their thoughts, had not this oath, imposed under the penalty of expulsion, compelled them to speak. Others complained of the “Et caetera,” which they said contained they knew not what. Mr. Baxter studied the best books he could find upon this subject, the consequence of which was, that he utterly‘ disliked the oath. In 1640, he was invited to be minister at Kidderminster, which he accepted; and had been here two years when the civil war broke out. He was a favourer of the parliament, which exposed him to some inconveniences, and obliged him to retire to Gloucester; but being strongly solicited, he returned to Kidderminster. However, not finding himself safe in this place, he again quitted it, and took up his residence at Coventry, where he lived in perfect quiet, preaching once every Sunday to the garrison, and once to the town’s people, and contending warmly against the Anabaptists. After Naseby fight, he was appointed chaplain to colonel Whalley’s regiment, and was present at several sieges, but was never in any engagement, although a story was afterwards raised that he had killed a man in cool blood, and robbed him of a medal. This was first told by Dr. Boreman of Trinity college, Cambridge, and became very current until Mr. Baxter refuted it in his “Catholic Communion,” 1684. In 1647 he was obliged to leave the army, by a sudden illness, and retired to sir Thomas Rouse’s, where he continued a long time in a languishing state of health. 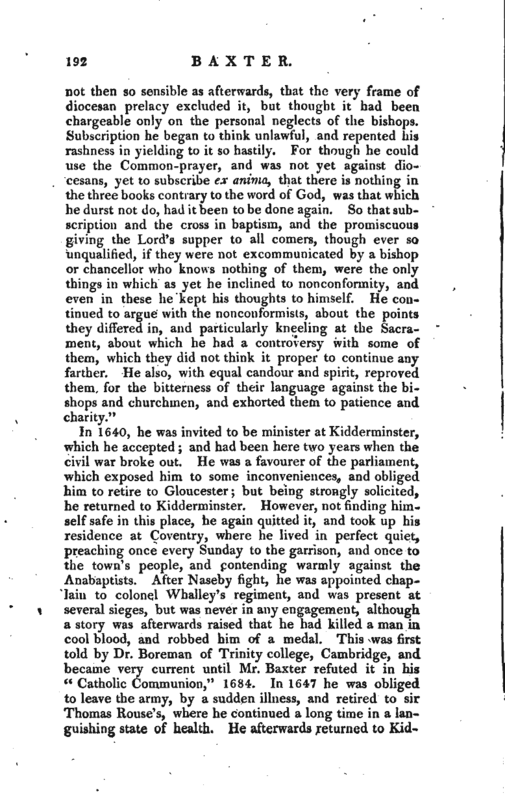 He afterwards returned to | Kidderminster, where he continued to preach with great success. He is said to have impeded, as far as was in his power, the taking of the covenant, and what was called the engagement, and hoth spoke and wrote against the army marching to Scotland to oppose Charles II. 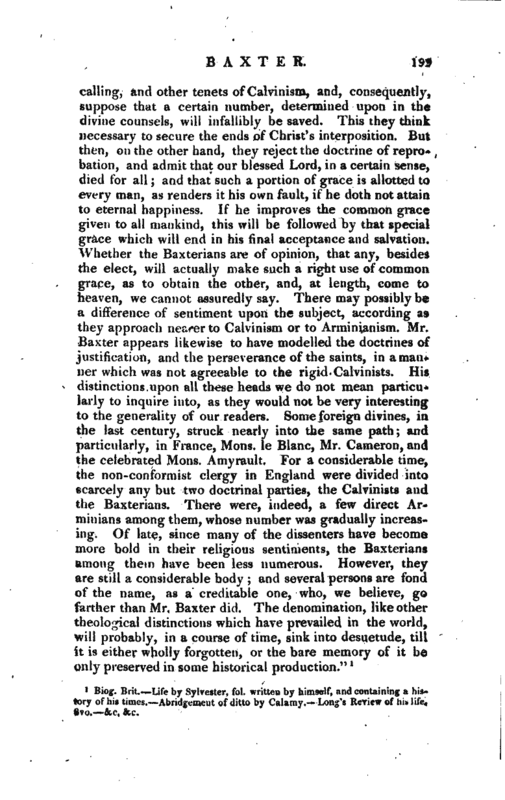 And when Cromwell gained the superiority, Mr. Baxter expressed his dissatisfaction to his measures, hut did not think proper to preach against him from the pulpit: once indeed he preached Before the protector, and made use of the following text: “Now I beseech you, brethren, by the name of our Lord Jesus Christ, that ye all speak the same thing, and that there be no divisions amongst you, but that ye be perfectly joined together in the same mind and in the same judgment.” He levelled his discourse against the divisions and distractions of the church. A while after Cromwell sent to speak with him: when he began a long and serious speech to him of God’s providence in the change of the government, and how God had owned it, and what great things had been done at home and abroad in the peace with Spain and Holland. 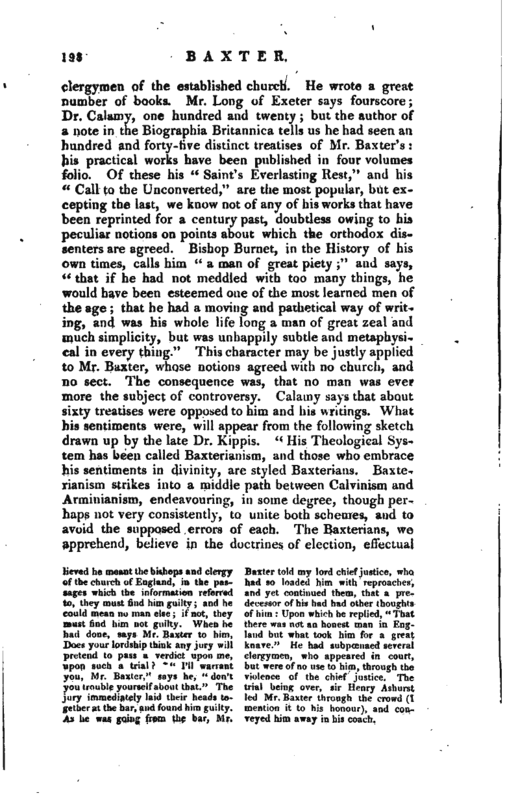 Mr. Baxter told him, “It was too great condescension to acquaint him so fully with all these matters, which were above him: but that the honest people of the land took their ancient monarchy to be a blessing, and not an evil; and humbly craved his patience, that he might ask him, how they had forfeited that blessing, and unto whom that forfeiture was made r” Upon this question Cromwell became angry, and told him, “There was no forfeiture, but God had changed it as pleased him;” and then he reviled the parliament, which thwarted him, and especially by name four or five members, Mr. Baxter’s particular acquaintances, whom he presumed to defend against the protec tor’s passion. 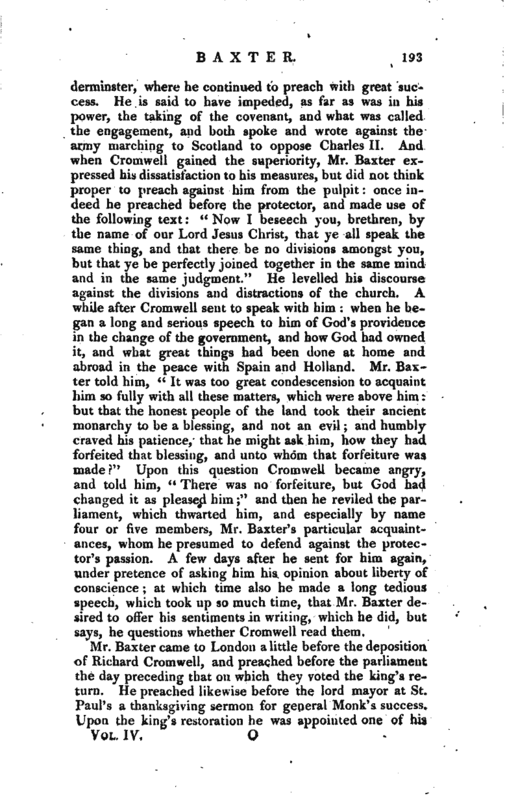 A few days after he sent for him again, under pretence of asking him his opinion about liberty of conscience; at which time also he made a long tedious speech, which took up so much time, that Mr. Baxter desired to offer his sentiments in writing, which he did, but says, he questions whether Cromwell read them. Mr. Baxter came to London a little before the depositioa of Richard Cromwell, and preached before the parliament the day preceding that on which they voted the king’s return. He preached likewise before the lord mayor at St. Paul’s a thanksgiving sermon for general Monk’s success. Upon the king’s restoration he was appointed one of his | chaplains in ordinary, preached once before him, liad frequent access to his majesty, and was always treated by him with peculiar respect. 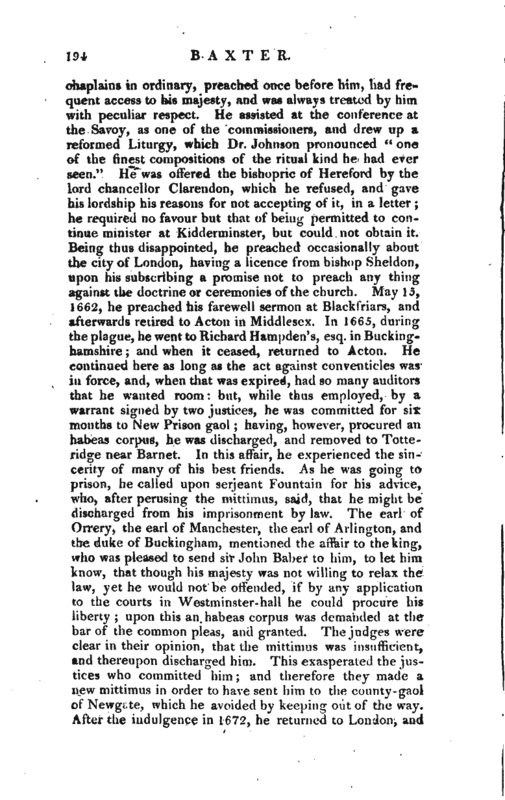 He assisted at the conference at the Savoy, as one of the commissioners, and drew up a reformed Liturgy, which Dr. Johnson pronounced “one of the finest compositions of the ritual kind he had ever seen.” He was offered the bishopric of Hereford by the lord chancellor Clarendon, which he refused, and gave his lordship his reasons for not accepting of it, in a letter; he required no favour but that of being permitted to continue minister at Kidderminster, but could not obtain it. Being thus disappointed, he preached occasionally about the city of London, having a licence from bishop Sheldon, upon his subscribing a promise not to preach any thing against the doctrine or ceremonies of the church. 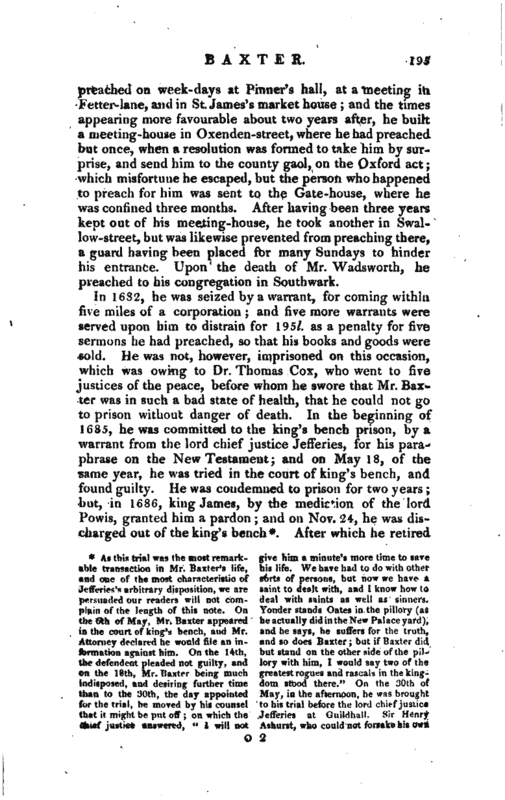 May 15, 1662, he preached his farewell sermon at Blackfriars, and afterwards retired to Acton in Middlesex. In 1665, during the plague, he went to Richard Hampden’s, esq. in Buckinghamshire; and when it ceased, returned to Acton. He continued here as long as the act against conventicles was in force, and, when that was expired, had so many auditors that he wanted room: but, while thus employed, by a. warrant signed by two justices, he was committed for six months to New Prison gaol; having, however, procured an habeas corpus, he was discharged, and removed to Totteridge near Barnet. In this affair, he experienced the sincerity of many of his best friends. As he was going to prison, he called upon serjcant Fountain for his advice, who, after perusing the mittimus, said, that he might be discharged from his imprisonment by law. The earl of Orrery, fche earl of Manchester, the earl of Arlington, and the duke of Buckingham, mentioned the affair to the king, who was pleased to send sir John Baber to him, to let him know, that though his majesty was not willing to relax the law, yet he would not be offended, if by any application to the courts in Westminster-hall he could procure his liberty; upon this an habeas corpus was demanded at the bar of the common pleas, and granted. The judges were clear in their opinion, that die mittimus was insufficient, and thereupon discharged him. This exasperate;! the justices who committed him; and therefore they made a new mittimus in order to hn.ve sent him to the connty-gnol of Newgi-te, which he avoided by keeping out of the way. After the indulgence in 1672, he returned to London, and | preached on week-days at Pinner’s hall, at a meeting in. Fetter-lane, and in St. James’s market house and the times appearing more favourable about two years after, he built a meeting-house in Oxenden-street, where he had preached but once, when a resolution was formed to take him by surprise, and send him to the county gaol, on the Oxford act; which misfortune he escaped, but the person who happened to preach for him was sent to the Gate-house, where he was confined three months. After having been three years kept out of his meeting-house, he took another in Swallow-street, but was likewise prevented from preaching there, a guard having been placed for many Sundays to hinder his entrance. Upon the death of Mr. Wadsworth, he preached to his congregation in South wark. lieved he meant the bishops and clergy of the church of England, in the passages which the information referred to, they must find him guilty; and he could mean no man else; if not, they must find him not guilty. When he had done, says Mr. Baxter to him, Does your lordship think any jury will pretend to pass a verdict upon me, upon such a trial? 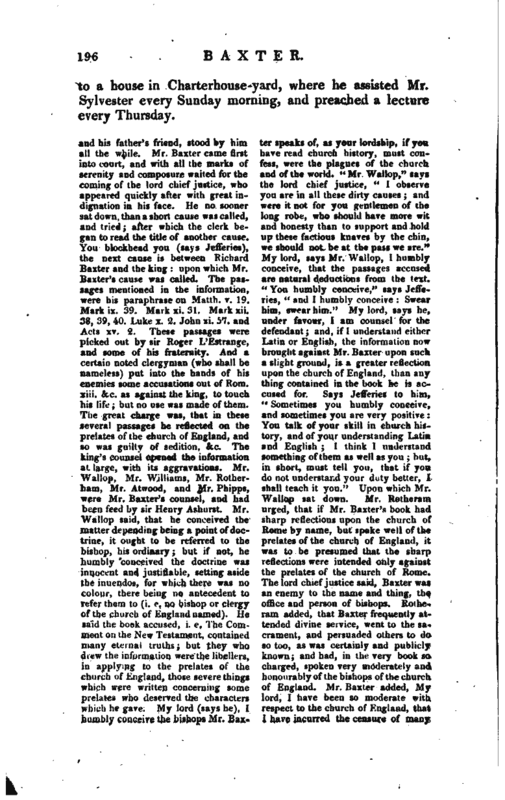 “I’ll warrant you, Mr. Baxter,” says he, “don’t you trouble yourself about that.” The jury immediately laid their heads together at the bar, and found him guilty, As he was going from the bar, Mr. Baxter told my lord chief justice, who had so loaded him with reproaches, and yet continued them, that a predecessor of his had had other thoughts of him: Upon which he replied, “That there was not an honest man in England but what took him for a great knave.” He had subpoenaed several clergymen, who appeared in court, but were of no use to him, through the violence of the chief justice. The trial being over, sir Henry Ashurst led Mr. Baxter through the crowd (I mention it to his honour), and conreyed him away in his coach.
. Biog. Brit.—Life by Sylvester, fol. 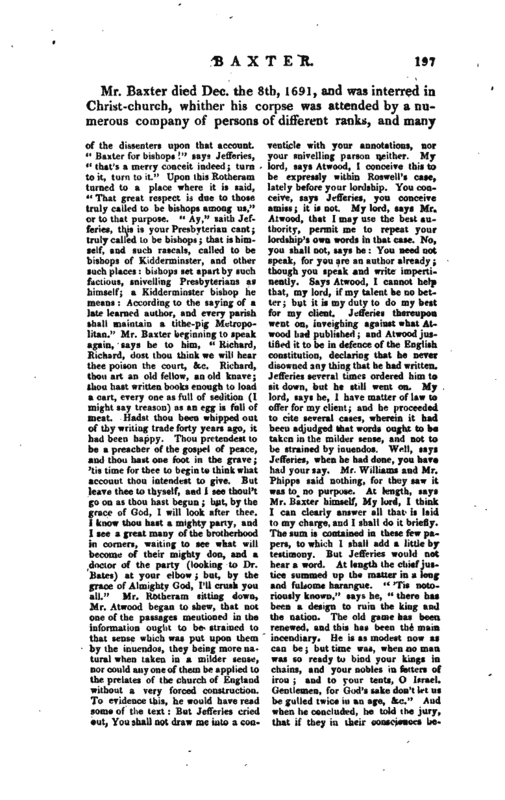 written by himself, and containing a history of his tunes.—Abridgement of ditto by Calamy.—Long’s Review of his life, 8vo.—&c. &c.